ong ago, in the early 1600s, a group of people in England wanted to pray and worship God in their own way. The King controlled the Church of England, and everyone was ordered to go to the same type of church. Anyone who dared to disobey would be sent to jail. The group of people who wanted to free the Church of England from the King's rule, making it "pure" were known as the Puritans. To escape the rule of the King and his church, around 100 men, women and children left their homeland, with their dream of religious freedom. They sailed on a ship, the Mayflower - on a pilgrimage to the New World. These brave travelers - the Pilgrims - landed in Plymouth after their long six-week journey. It was December 11, 1620. The cold winter had set in. The land was strange to them, and nothing seemed familiar. The winter was long, cold, and very hard for the Pilgrims. Luckily, Native Americans helped by supplying them with seeds and food, teaching them about their new home, and giving them the skills needed to survive in a strange, new land. The first year in their new home was hard for the Pilgrims. Many died. 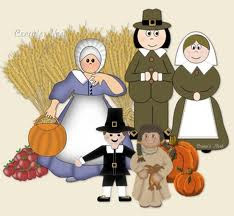 With seeds and plants received from the Native Americans, the Pilgrims planted crops. The fall harvest was a good one. To celebrate their good fortune, the Pilgrims had a feast of thanksgiving. Many foods were cooked for the feast - wild turkey, duck, and venison were probably served, along with fish, pumpkins, squash, corn, sweet potatoes, and cranberries. Captain Miles Standish, the leader of the Pilgrims invited all of the Native Americans who had helped them so much during their first year. Everyone had a good day of thanksgiving. The feast lasted for three days! Thanksgiving, or Thanksgiving Day, is a traditional North American holiday, which is a form of harvest festival. The date and whereabouts of the first Thanksgiving celebration is a topic of modest contention, though the earliest attested Thanksgiving celebration was on September 8, 1565 in what is now Saint Augustine, Florida. Despite scholarly research to the contrary, the traditional "first Thanksgiving" is venerated as having occurred at the site of Plymouth Plantation, in 1621. Today, Thanksgiving is celebrated on the second Monday of October in Canada and on the fourth Thursday of November in the United States. THANKSGIVING USA 2011: 24th November!